Everyone loves a good birth story right ? Firstly I would just like to say - it was far from my natural pool birth I had first imagined - but that's the thing about birth - you can only plan so much, and you have to go with what's best for you and the baby in the end and I always tried hard to think about this and not be disappointed with the result. So please be kind and remember everyone has their own stories. It's been 7 weeks now and I am only just able to get my laptop out to write this up - and that's because I'm staying up past my 9pm bedtime ! Newborns take up a lot of time and energy - I will write about this soon ! So on to the birth story - just to fill you in, I had gestational diabetes in pregnancy so I had an induction booked in for 6 days after my due date - which happened to be Friday 13th, can you believe it! I was told chances of her coming on this day were slim however ha. My due date came and went. I was totally happy with this though - I absolutely loved being pregnant, loved my bump and never for one second got to that point where I was fed up and 'wanted her out'. It's amazing how many people ask you 'is there a baby yet' though ! ha, again I wasn't annoyed as I know people were just excited. 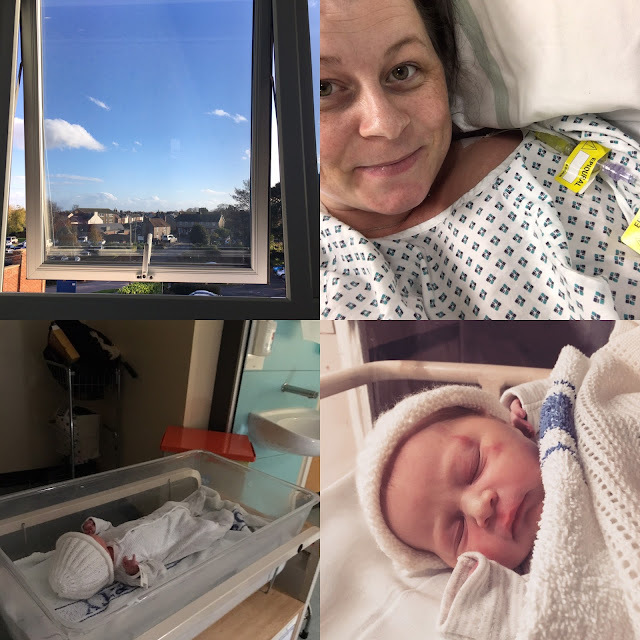 The morning of my induction I suddenly felt quite anxious, for weeks I had been going to bed wondering if that could have been the night (which was so strange!!) and the day had come for us calmly to go in to hospital. I was really happy about this aspect of the process as I was worried about working out when was the right time to go to hospital being in labour, so it was nice to get the car packed and drive there not being in any pain. I had been meaning to do some hypnobirth in pregnancy but for various reasons hadn't really got around to it properly but I was part of a Facebook group - the calm birth school and in a little panic I emailed Suzy and asked if I could get the MP3s to have a listen to. She very kindly sorted this out for me and sent them over but the best piece of advice she gave me was to do what I could to increase my endorphins. So, I ran a bath, with my favourite pink bath bomb, lit my favourite candle and played my relaxing labour playlist I had set up on spotify. It really worked and calmed me down. We arrived at the hospital and were shown up to the induction room. It might sound silly to some, but I was so nervous about getting the pessary as I had had a sweep a few days earlier and oh my gosh did it hurt ! I mentioned my concern to the midwife and she very kindly got me some gas and air so don't be afraid to ask ! It was amazing. This initial one was for 24 hours and nothing happened. We wandered the hospital, went for food, even had another visit from my parents who I had said 'see you on the other side' a few times to already. I have never been in to hospital before, but I somehow managed to feel really relaxed and calm. We were shown to the ward and had a bed next to the window which was lovely as the sun was shining. Then it was time for the next pessary (and the gas and air again!) and this time, my waters broke. It was 2:30am and Si had gone home but I was woken to a contraction and what felt like a trickle of water. I pressed my call bell and the lovely midwife came to see me. She asked me if I'd been to the toilet yet and I said no as I was too scared to stand up haha ! Sure enough, when I did - gush. Definitely something happening. I left it a little while as has been told it would be a few hours yet and text Si to let him know to come in in the morning! I managed to snooze a little in between contractions whilst timing them on my app. By the time he arrived, they were a little more intense that I had to stop and breath through them. It was getting exciting. I was never nervous, just so excited and happy. We were then taken up to the labour ward about 11am. I thought long and hard about pain relief as I had been pretty open minded up until now, but having needed gas and air for the pessary - I decided to opt for an epidural. Something I didn't think I would, but I am SO glad I did and you'll see why. I still managed to stay calm through all this and even snoozed through contractions. I could still feel them and my legs too a little, but no pain, I have to say it was absolute bliss. It was quite strange however to not experience the whole long pushing stage squeezing Si's hand and screaming - but I was OK with that. I had a further drip to speed things up a little but we were told to expect her late that evening or in the early hours, so I was saying it was a shame I was going to have a different midwife to the lovely one I had had all day as she finished at 8:30pm. I got through so many over my 4 night stay - but all of them were so lovely. 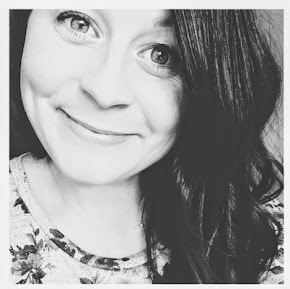 It got to about 7pm and Si had just come back from having some dinner and the midwife was out the room and I noticed her heart rate had dropped quite dramatically on the monitor. I called her in right away and she called the registrar to take a look. In about 3 - 4 hours I had gone from 1cm to fully dilated and she could see her head ! She told me not to worry but it was now an emergency situation because of her heart rate dropping and they needed to get her out asap. With forceps. So many people came in the room and I think an alarm sounded. It was all very busy and could have been scary but luckily in our ante natal class we had been told about the number of people that might rush in, so I knew that it was OK and they all had a job to do. I listened carefully to what she was telling me and pushed. I could feel the pressure when she crowned and it was so amazing. I think I pushed about 4 times and she was out. The official time of this stage was 14 minutes. Crazy. She was put right on me but I told them to go and get her checked out, I just wanted her to be OK. She had the cord around her neck twice which has caused the drop in heart beat. After what seemed like a lifetime she cried. And I cried. She was all cleaned up and put on me for a cuddle, I can't even explain what this felt like. I couldn't quite believe she was here as it all happened so quickly. She was perfect. She then had a slight grunty breath however so was taken away again to the intensive care unit for some tests. I remember watching her being taken away, not knowing if she would come back, but at the same time, thinking that my Mum had ben through this with me when I was born, so it would be OK. Again it seemed like forever, but she was brought back about an hour later (I think it's all a bit of a blur). I remember when it was just me and Si in the room when she was away, it all just hit me and I cried for about 20 minutes solid. Uncontrollably. It's such a crazy experience, but the most wonderful too. I couldn't believe our baby girl was here. We then had a little bit of time to compose ourselves when she came back and came to terms with what just happened so quickly and then called our families to share our wonderful news. We were parents. So amazing & everyone was so happy. I am so glad looking back that I had the epidural as I was able to stay calm when it all happened and they got her out safely. This was my main concern all along so I was happy. It's so emotional thinking back to and I am sure I will share lots more but for now that's the main story of the birth of my beautiful little girl. She had a mark on her little face from the forceps when she was born but it was virtually gone the next day. I have to say - my stay in hospital was incredible and I can't thank the staff at St Richards Chichester enough - they were all so wonderful, I really miss them as you really become close to them - they are such wonderful midwifes! My lovely diabetic one, Natasha even found me after she was born to come and have a cuddle, it was so lovely. 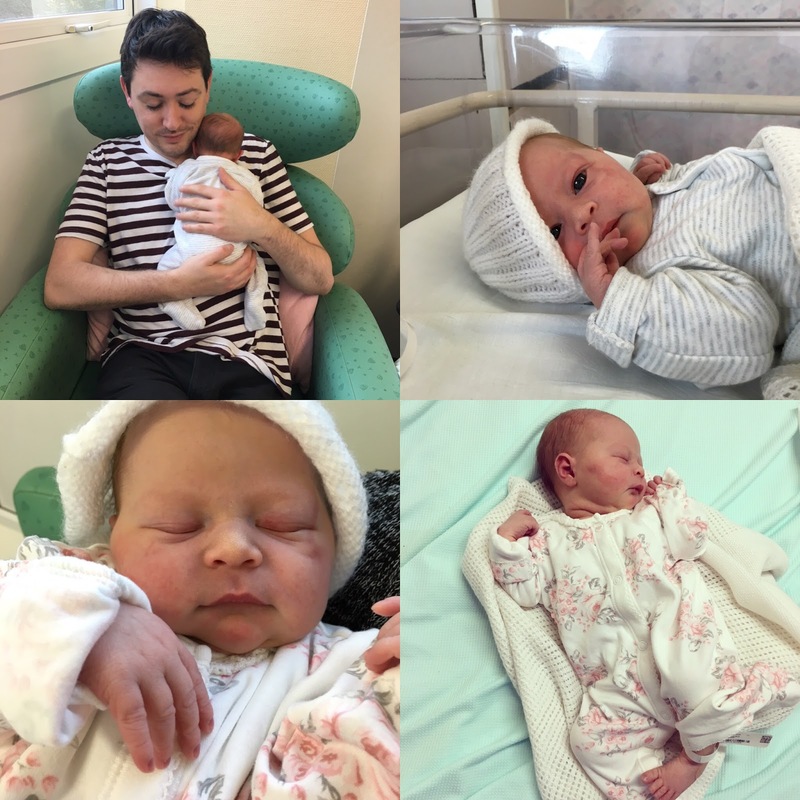 Anyway, to those of you who don't follow me on Instagram - Evie Michelle Inglis-Lisher was born at 7:24pm on 15th November 2015 and we are so totally in love with her. These past 7 weeks have been a roller coaster of emotions (I'll go in to that later) but it's been the most incredible time of my life. Here are a few pics from the day and I will share more soon ! Let me know if theres anything you'd like to know and I'll be happy to answer!